Around Zornitza Family Estate Relais & Châteaux your eyes would roam over Slavyanka mountains and the Ali Botush natural reserve, Belasitza and its century-old forests, the magnificent Pirin, Ograzhden, and others. Their depths hide eco trails of varying difficulty, biking tracks, picnic locations, fishing and hunting opportunities. The Estate borders the canyon of the Melnishka river that is lined with dense forests. There is also an eco trail that runs along the bank of the river. Incredible rock formations spread on an area of 50 sq. km. The pyramids have acquired their present appearance due to the erosion of the clay soil. They are still taking shape and their appearance and form change over time. These enchanting natural sculptures have a variety of contours and shapes resembling rock mushrooms, stacks of hay, minarets, alpine ridges and peaks, swords, obelisks, Egyptian pyramids, Gothic temples etc. This unique natural phenomenon attracts tourists from all over the world. 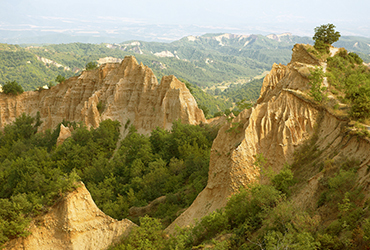 A walking route in the protected area of the Melnik sandstone pyramids that takes about 4 and a half hours to be completed. The journey starts from Melnik, it goes to the Rozhen Monastery and from there to Zlatolist village and to the church of Reverend Stoyna. From Zlatolist the eco path leads back to Melnik. A 1295-year-old Platanus tree rises in the village. It is believed that it helps with various diseases. The eco trail is built and fortified with natural materials only there are stairs, benches, alcoves, fireplaces. A wonderful route for active recreation or picnic. Several picturesque waterfalls near our estate offer incredible natural scenery, numerous hiking trails and are an attractive place for lovers of outdoor excursions, hunt and fishing. Popina Luka waterfall is located along the Bashliitsa River. It is 12 meters high and 1230 meters above sea level. 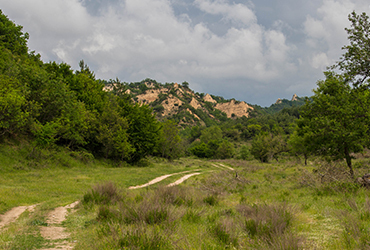 The area abounds in centuries-old coniferous forests, mixed with some deciduous species. 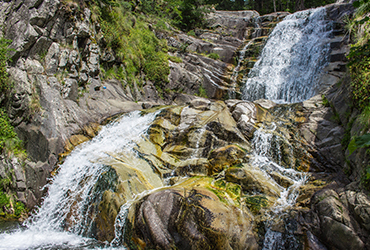 Skoka waterfall in the village of Kashina is one of the largest in the southern Pirin Mountains. It is about 20 meters high. When the water crashes into the rocks produces a fine water mist, which cools pleasantly in the hot summer days. Don't miss the Smolarski waterfall, which is located in the Republic of Macedonia and is an impressive 40 meters high. The cave is located at 120 km from Zornitza Family Estate Relais & Châteaux in the Republic of Greece, about an hour and a half car drive. The road is paved, part of it is on the highway. The cave covers an area of ​​at least 25,000 sq. m, and a length of 3,000 m. It is distinguished by its unique and extremely rare ecosystem. Flora covering the entire surface of the cave dates back at about two million years. 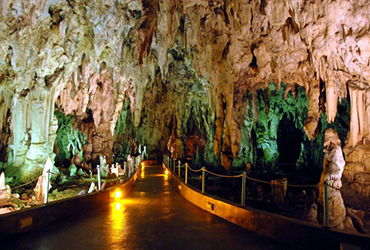 The great variety of stalactites and stalagmites, with thousands of curves and shapes, captivates the imagination, it charms and enchants the visitors. The impressive formations are silently sculpted for millions of years. Numerous cave formations surpass all expectations with their wealth and beauty. The scene of snow-white stalactites reaching a height of about 35 m at some places and the incredible red background, grasps the hearts of visitors.